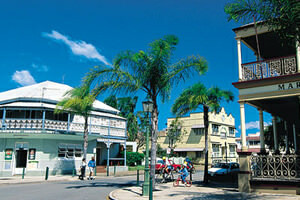 With its wonderful sub-tropical climate the Fraser Coast makes for an ideal holiday destination any time of the year. In summer, temperatures hover around a warm 27c and in winter around 22c. Kondari Resort can assist you in all of your tour requirements and with such a great range of day trips and activities; you may need more than a couple of days to fit everything in! 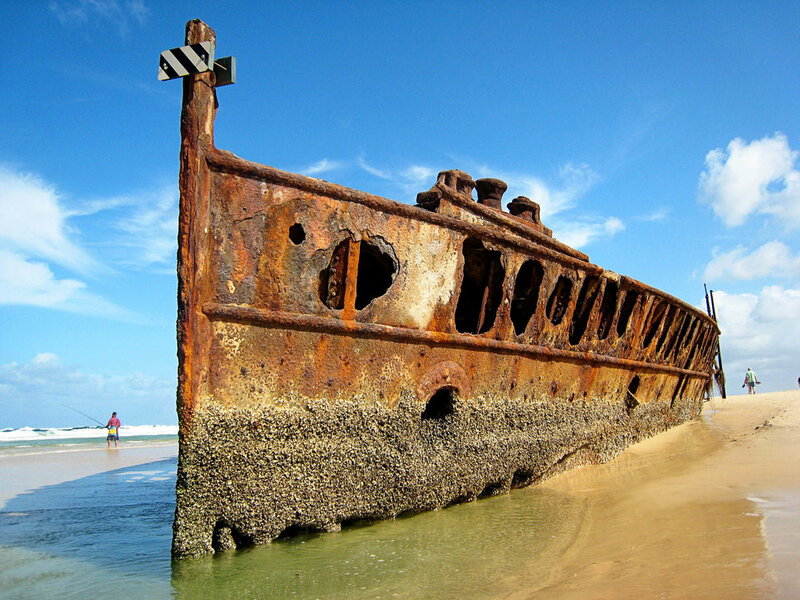 World Heritage Listed Fraser Island - The World's largest sand island! Just a taste of this World Heritage listed paradise will leave you feeling charmed and captivated. Fraser Island is a unique natural environment - the largest sand island in the world and the only place on the planet where old growth rain-forest grows on sand. Fraser Island's abundant pristine fresh water lakes and crystal clear creeks are great spots to view unique flora and fauna and also provide a welcome oasis on hot summer days. Scenic four wheel drive circuits and walking tracks take in some of the largest of the lakes, cool and peaceful rain-forests of towering satiny and brush box trees, some over a thousand years old, contrast with swampy wetlands, heath lands full of wild flowers and coastal stands of Pandanus palms. Hervey Bay is Australia's Whale Watching Capital! The annual migration of Humpback whales into Hervey Bay between late July and early November is a time to celebrate these majestic mammals. There is no better place to experience their antics and their awesome size than up close on a whale watching cruise in the protected waters of the Great Sandy straits Marine Park. See the Humpback whales frolic in their favourite playground and appreciate why Hervey Bay is renowned as Australia's Whale Watching capital. Kondari Resort offers fabulous whale watch and accommodation packages with a variety of whale watch cruises to choose from. Hervey Bay has beautiful beaches, calm stinger-free waters and from August to October, the best whale-watching experience found anywhere in the Australia. 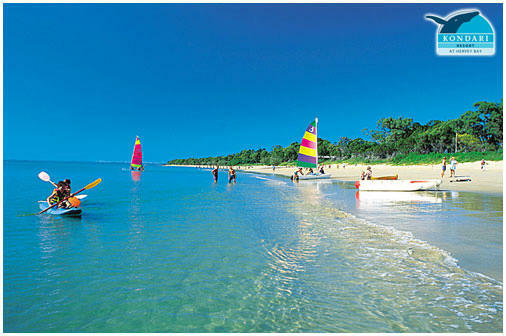 Hervey Bay is situated approximately 300 kilometres, 3½ hours drive, north of Brisbane. Bordered by 40 kilometres of pristine beaches, Hervey Bay offers access to islands, adventure, wildlife and a beautiful safe aquatic playground for visitors to the Fraser Coast. Hervey Bay City, boasting one of the fastest growing populations in Australia, is renowned for its Whale Watching and as the gateway to World Heritage-listed Fraser Island. The foreshore of the City offers fourteen kilometres of shared pedestrian, wheelchair and bicycle pathways. Located three hours North of Brisbane, Maryborough was a major immigration port into Australia and a visit to the Wharf Street Precinct retains many reminders of this period. Much of Maryborough's character has been preserved in classic Queenslander houses, mostly built of local timber in a range of sizes and designs. Gracing the city's broad tree-lined streets, these homes have given Maryborough a reputation as one of the most beautiful historic locations in Queensland. Enjoy the Maryborough Heritage markets every Thursday morning and meet the Town Crier and Mary Heritage! The Maryborough time cannon, fired every Thursday at 1pm has a rich history & you can find this out and more at the Maryborough Heritage Gateway on Wharf Street. The southern most coral isle on the Great Barrier Reef, Lady Elliot Island is regarded as one of the best reef diving locations in Queensland. The tropical waters allow up to 25 metres of visibility at the 19 recognised dive sites. Divers from around the world regard Lady Elliot Island as a premier destination. Non-divers can sample the island's hidden beauty by snorkeling or swimming in the clear tropical waters. Experience the beauty of Lady Elliot Island for a day & enjoy magical snorkeling, glass bottom boat tours, guided reef walks, buffet lunch and return air transfers. Day trips depart from Hervey Bay every day (weather permitting) and tours can be booked from the tour desk at Kondari.